Amid declining growth and moderating inflation, the RBI is likely to pause hike in interest rates at the mid-quarterly review of the monetary policy tomorrow. The RBI, which has raised interest rates 13 times since March 2010, to tame inflation, may change the tight monetary stance as the industrial production has turned negative in October recording a fall of 5.1 per cent. Food inflation fell to a nearly four-year low of 4.35 per cent during the week ended December 3, reflecting a decline in prices of essential items like vegetables, onions, potatoes and wheat. Gold today recorded its steepest fall in over two months and lost Rs 800 to Rs 28,140 per 10 grams, on frantic selling by stockists on weak global trend and sluggish domestic demand. Gold had plunged by Rs 835 on October 5. Billionaire Mukesh Ambani-led Reliance Industries Ltd (RIL) today regained its position of the Indian stock market's most influential company, pushing the newly-crowned leader Infosys to the second place. Notwithstanding economic slowdown, the overall advance tax payout by top 100 companies jumped over 10 per cent in the third quarter of the current fiscal and software major TCS reported the maximum hike. Private telecom operator Connect is set to roll out its fibre to the home (FTTH) service in Punjab. Aimed at roping in maximum Internet users in its fold, the company is looking at launching this service in the Chandigarh region (comprising Chandigarh, Zirakpur, Mohali and Kharar), Ludhiana, Mandi Gobindgarh, Jalandhar, Phagwara, Amritsar, Bathinda and Patiala. In the initial phase, the company is targeting high rise buildings located in these cities, college/university campuses, IT parks and industrial areas where IT industry is located. As regards price situation, although the headline inflation has remained close to double-digit mark in November, there are signs of moderation. The food inflation, according to the data released today, fell to a nearly four-year low of 4.35 per cent during the week ended December 3. The RBI in its mid-year policy in October had indicated that it might halt rise in interest rate if the inflationary situation does not worsen. The bigger worry on the economic at this time is to arrest falling growth. "Domestically, the struggle against inflation and tightening interest rate regime has contributed to lowering of growth in demand and investment. 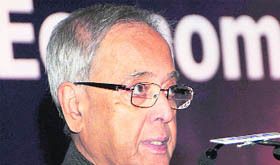 The slowdown in industrial growth is of particular concern as it impacts employment," Finance Minister Pranab Mukherjee said in New Delhi. SBI Chairman Pratip Chaudhuri had said yesterday that he did not expect the RBI to hike interest rate in its next policy. "I don't think so because food inflation has come down significantly and steadily. RBI has said 7 per cent is the level they are targeting", he told reporters. Besides, other experts and economists too are of opinion that RBI would pause hike in interest rate because of economic slowdown and decline in rate of price rise. Chaudhuri added, however, that he does not expect RBI to slash the Cash Reserve Ratio (CRR) as it would be contradictory to the monetary stance of targeting inflation. ICRA Economist Aditi Nayar said RBI is likely to keep the rates unchanged because though food inflation has fallen, manufactured products inflation still remains at an elevated level of 7.7 per cent. Mumbai: The RBI on Thursday swung into action to check slide in rupee value against dollar and speculations by imposing restrictions with immediate effect on forward trading in the local currency by FIIs and traders and capped banks exposure to the forex market. The apex bank has decided to withdraw the facility of re-booking forex contracts by companies and Foreign Institutional Investors (FIIs) and reduced across-the-board exposure limits of banks which are authorised to deal in the foreign currency. 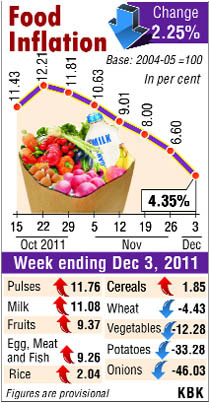 This is the lowest rate of food inflation since the week ended February 23, 2008, when it stood at 4.28 per cent. Food inflation, as measured by the Wholesale Price Index (WPI), stood at 6.6 per cent in the previous week. It was recorded at 10.78 per cent in the corresponding period last year. Experts feel the moderation in the rate of price rise of food items below the psychological 5 per cent-mark will bring relief to the government, which has been battling high inflation for almost two years now. According to data released by the government today, onions became cheaper by 46.03 per cent year-on-year during the week under review, while potato prices were down by 33.28 per cent. Prices of wheat also fell by 4.43 per cent. The rupee slipped to sub-54 level for the first time in its history in early trade today against dollar, but staged a smart recovery, possibly on RBI's intervention, to settle seven paise higher at 53.64/65 after a highly volatile trade. The local currency swung wildly between 54.30 and 53.64, after slipping to sub 54-level in the opening trade itself at the Inter-bank Foreign Exchange here. Traders said selling pressure gathered momentum, as the metal in overseas markets dipped below $1,600 an ounce on deepening euro-zone debt crisis and boosting the dollar. In addition, reduced offtake on the domestic front due to the end of the marriage season also weighed on the yellow metal's prices here. On similar lines, silver tumbled by Rs 3,200 to Rs 52,600 per kg, on fall in demand from industrial units and silver coin manufacturers. Gold in global markets, which normally sets the price trend on the domestic front here, tumbled by $54.40 to $1,576.50 an ounce and silver by 6.10 per cent to $28.96 an ounce in New York last night. At the end of today's trade, RIL's weightage on the market barometer index, the Sensex, stood at 10.39 per cent - the maximum for any constituent of the 30-share index and higher than Infosys' 10.21 per cent. IT giant Infosys had toppled RIL from the top position on December 12, but could not retain its lead over the retail-to-energy conglomerate for long. Measured in terms of its Sensex weightage, RIL has enjoyed its position as the most influential stock for many years and the movement in its share price has been crucial for any major fall or rise in this index. Earlier on December 12, RIL had slipped to second position after Infosys in terms of its Sensex weightage, which is measured by the market value of a company's free-float or non-promoter shares that can be freely traded in the market. On that day, Infosys commanded a Sensex weightage of 10.25 per cent, higher than RIL's 10.08 per cent. Infosys retained its lead over RIL for three days till December 14. TCS, the country's largest software exporter, paid up Rs 530 crore in the third quarter against Rs 230 crore in the same period last year. Tata Motors saw the maximum dip (Rs 80 crore Vs Rs 220 crore), according to the Income Tax Department. "Overall, the tax payout by the top 100 corporates jumped over 10 per cent this quarter over the year-ago period. This is excluding the oil companies which paid no taxes this time around," a senior income tax official said this evening here, requesting anonymity. Major taxpayers like the largest private sector company Reliance Industries, SBI, Tata Motors, and Mahindra & Mahindra among others, made lower payments this time around. RIL paid only Rs 1,000 crore for the period against Rs 1,190 crore in the comparable quarter, while SBI paid 1,730 crore, down from Rs 1,860 crore. M&M's payout fell marginally to Rs 220 crore from Rs 230 crore. Piramal Healthcare paid no tax this time around against a whopping Rs 1,200 crore last year. So was Reliance Communications, while its sister concern RInfra paid Rs 60 crore against nil in the comparable period. These numbers come amidst the gloom spreading in the economy: the factory output number for October came as a rude shock. At a contraction of 5.1 per cent, this has been the steepest fall in industrial production since June 2009. Talking to The Tribune here today, Prem Ojha, business head, Connect Wireline and Broadband, said their FTTH service would not meet the same fate as the one launched by BSNL earlier this year. Since its launch, nine months ago, BSNL has failed to get more than 100 customers for this service. “The reason why we foresee success in FTTH is because we are offering the service at affordable rates. We are offering Internet speed of anything between 3 mbps to 100 mbps, at rates varying between Rs 1,247 and Rs 7,997 (for 100 mbps) per month,” he said. Ojha said they had successfully tested the service in two high-rise buildings of Zirakpur and are expecting to have over 50,000 customers by the end of this financial year. “We are now identifying pockets which have a habitation of over 10,000 and are looking at targeting 3,000 connections in each of these pockets,” he added. Talking about the success of the company’s wireless broadband service in Punjab, launched three months ago, Ojha said they had already roped in 150 customers. By the end of this month, we are looking at providing this service in over 50 high rise buildings, mainly in the Chandigarh region, he added. Ojha said though the Internet penetration in Punjab (over 14 per cent) was much higher than the national average, there was still a large untapped market and the company was leveraging on this market to expand its broadband business.